Part of my official Instagram bio identifies me as a “Siamese Cat Lover,” and most of my posts are hashtagged #catlady. Now, my green beauty arsenal is full of literal Crazy Cat Lady concoctions thanks to a fellow #greenbeautycatlady. And of course, there’s a bit of cat hair covering everything. Before you write off the serious green goodness of this line because of its playful packaging and approach, let’s examine the credentials of the crazy cat lady behind this cheeky collection. Sher, a holistic aesthetican, aromatherapist and cosmetologist, created this line to appeal to the playful green beauties who take their skincare seriously, but know how to have a good time. In a green beauty world that spans from DIY and drugstore to apothecary-style and luxury, Crazy Cat Lady stands out as that funky, funny line that you’d spot in a place like Urban Outfitters and pick up because it’s just too cute. Imagine if all the quirky little products at stores like that made you laugh and were actually good for your skin?! While packaging and social good are important to great green beauty product, I love that Crazy Cat Lady doesn’t skimp on the very thing that buy products for: effective ingredients. In these two toners that I tried (I am obsessed with toners! ), I was thoroughly impressed at the blend of simple yet effective ingredients that fought blemishes and soothed irritated skin. 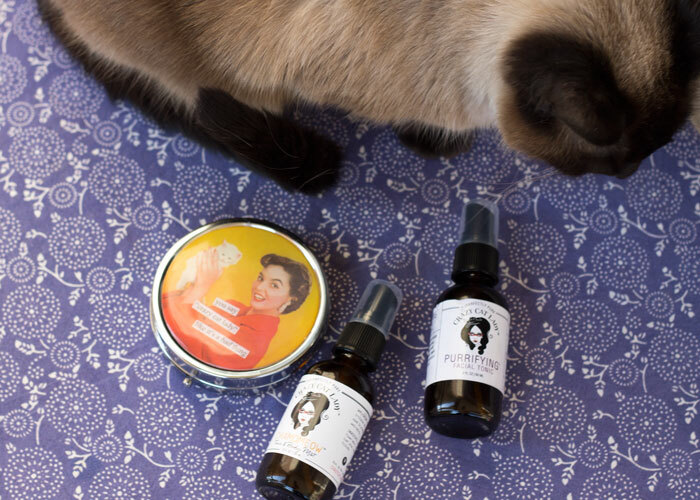 In the evening, I used Crazy Cat Lady Purrifying Facial Tonic to deeply clean my pores and treat my acne-prone skin to blemish-blasting willow bark and neem. A base of aloe leaf juice offered an all-around soothing solution to my skin. A fresh scent of orange, thanks to orange flower water, kept Crazy Cat Lady Purrifying Facial Tonic from smelling stinky (neem, looking at you). The mist from this toner’s glass spray bottle was the perfect consistency to get my full face, too — no shooting targeted streams of toner at my face! If willow bark is a bit too strong for your skin, you can always spray this toner onto a cotton pad and smooth it onto your skin. For daytime toning, my skin loved Crazy Cat Lady Chamomeow Face & Body Mist. A slightly lower price point, this face and body mist has a much more edited ingredients list with a focus on moisture and calm. The star ingredient, Roman chamomile, soothes skin and helps reduce redness and irritation. This is a lovely mist to use not only on your face, but — stay with me — your pits in the morning. If you’re like me and use natural deodorants with baking soda, you will probably at some point experience a bit of redness or irritation. I loved spritzing Crazy Cat Lady Chamomeow Face & Body Mist on my pits post-shower to prep my skin for my deodorant. This was especially helpful on those mornings when I just had to shave and then immediately apply deodorant (that can be a bit irritating with some formulas!). Chamomile, in combination with aloe, was just what my pit skin needed to stay calm and stress-free. On my face, I loved using this toner to get my face back to its normal coloring after a hot shower (hi, red skin) and was a wonderful lightly moisturizing setting spray to keep my skin looking radiant after I completed my daily makeup look. While I have an ever-growing list of holy grail, won’t-be-without-them toners, I’ll occassionally repurchase Crazy Cat Lady products. I love the Chamomeow Face & Body Mist as a pit soother and as a post-yoga body mist, and the Purrifying Facial Tonic is an excellent budget buy for an anti-acne toning treatment. 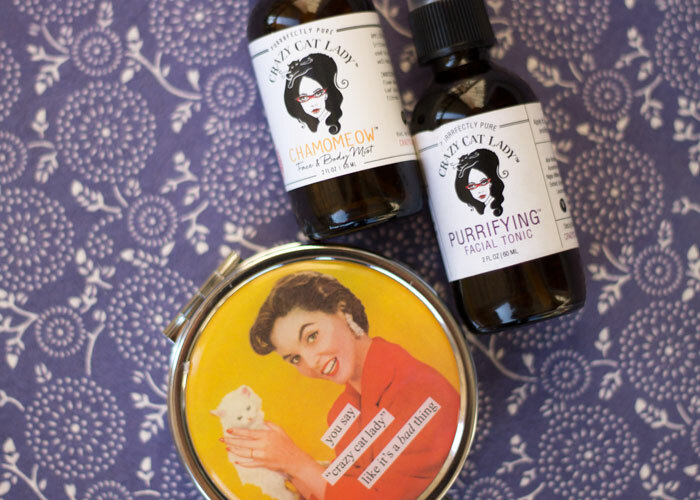 Fellow crazy cat ladies and green beauty lovers, have you tried Crazy Cat Lady? How important is cruelty-free beauty to you when you purchase new products? What kind of cat do you have? Tell me in the comments section!